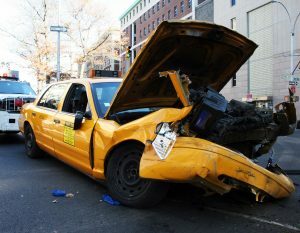 Jackson Law International sues over injuries sustained in a New York taxi crash on behalf of a German couple. A.K. (initials are utilized to safeguard the privacy of our client) and her husband and young child were on vacation in New York City, New York visiting the famous city as tourists from Germany. The family was excited about their visit to this world-renowned city, travelling in a taxi cab to their next destination when their taxi cab entered an intersection in downtown New York City and was struck by another vehicle that was proceeding through the intersection against a red light. While the husband and young child were unhurt, A.K. was not as fortunate. She suffered injuries to the right thumb of her dominant hand, as well as her left shoulder. A.K. was first treated in a New York City hospital and, thereafter, back in Germany by a highly respected German orthopedic surgeon. While the shoulder injury healed in the weeks after the accident, A.K. continued to experience limitations with respect to the range of motion of her right thumb. In time it became clear that the thumb injury was permanent in nature. Jackson Law International was retained to represent this family in New York City, and a lawsuit was filed against not only the driver but also the owner of the vehicle for the negligent entrustment of the vehicle to the driver. The lawsuit was filed not only by A.K. but also her husband, who had a consortium claim relative to his wife’s injuries. This family had made a conscious choice to not sue the taxi company, as there was no question in their mind that the taxi driver was not at fault. In such situations, it is prudent to also sue the taxi cab company and driver, as a jury might ultimately apportion some fault to the taxi cab driver. However, the family was insistent, and this represented some degree of risk for them. The insurance company for the owner of the vehicle was particularly stubborn throughout the litigation, claiming first that the driver did not enter the intersection against a red light and secondly that the injuries pre-existed the accident, relying upon their expert witness orthopedic surgeon who had reviewed the relevant MRI studies. While these are common tactics by defense attorneys and their hired expert witnesses, our law firm remained strong with respect to the question of liability and our assertion that there was no convincing evidence to support the position that the injuries sustained by A.K. in any way predated the accident. Ultimately, Jackson Law International was able to achieve a settlement for A.K. and her husband for this New York taxi crash that represented the full policy limits of the insurance policy that covered the owner of the vehicle and the driver, and left these clients very satisfied with the result. We would welcome the opportunity to discuss your case with you to determine whether you also might have a viable claim following your injuries.